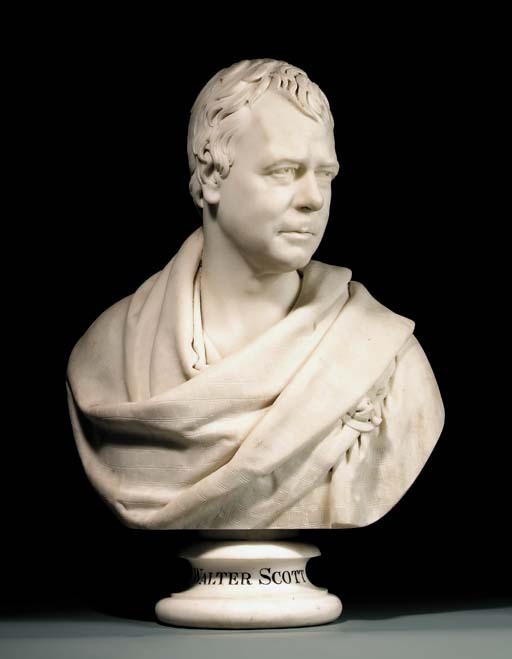 On a circular carved marble socle inscribed on the front 'WALTER SCOTT'; inscribed on the reverse 'SIR WALTER SCOTT BART. MODELED 1820. FINISHED FROM HIS FACE 1828. BY F. CHANTREY.'. Purchased by Sir Robert Peel, directly from Chantrey in 1838, and thence by descent. F. Russell, Portraits of Sir Walter Scott - A Study of Romantic Portraiture, London, 1987, no. 35, pp. 34-35. A. Yarrington, I. Lieberman, A. Potts and M. Baker, Walpole Society, 1991/1992 - An Edition of the Ledger of Sir Francis Chantrey, R.A., at the Royal Academy, 1809-1841, 1994, pp. 136-137. Sir Walter Scott (1771-1832), poet, editor and author of such classic novels as Ivanhoe, was a man of international standing. His fame in his own day was such that, as noted by Francis Russell (op. cit., p. 1), the only other individual painted as often as Scott was the Duke of Wellington. In 1820, Sir Francis Chantrey asked Scott if he would sit for a portrait to be executed first in plaster and then in marble. Seven sittings at Chantrey's studio were devoted to the portrait, the final one apparently in late April (ibid, p. 32). The original marble, and a second version executed for the Duke of Wellington in 1826, were the only autograph marbles of this composition, although 45 plaster casts were distributed to Scott's admirers, and numerous copies were subsequently executed by other artists. In 1828, Chantrey offered the original marble to Scott on the condition that he sit for an 'updated' portrait, to which the author consented. The composition is based upon the likeness produced from the sittings of 1820 but, as Chantrey was to say in a letter to Sir Robert Peel, 'The expression is more serious than in the two former Busts, and the marks of age more than eight years deeper' (quoted in Yarrington, et. al., op. cit., p. 136). That bust - the one presently being offered - was purchased by Peel in 1838 and has remained in the family up to the present day. Both the quality and the condition are superb.